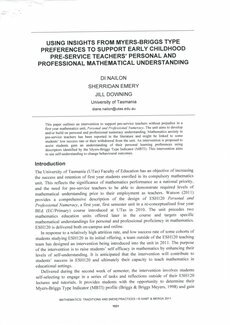 This paper outlines an intervention to support pre-service teachers without prejudice in a first year mathematics unit, Personal and Professional Numeracy. The unit aims to develop and/or build on personal and professional numeracy understanding. Mathematics anxiety in pre-service teachers has been reported in the literature and might be linked to some students’ low success rate or their withdrawal from the unit. An intervention is proposed to assist students gain an understanding of their personal learning preferences using descriptors identified by the Myers-Briggs Type Indicator (MBTI). This intervention aims to use self-understanding to change behavioural outcomes.